Most ball manufacturers recommend cleaning the surface of your ball immediately after bowling to improve longevity of surface performance. 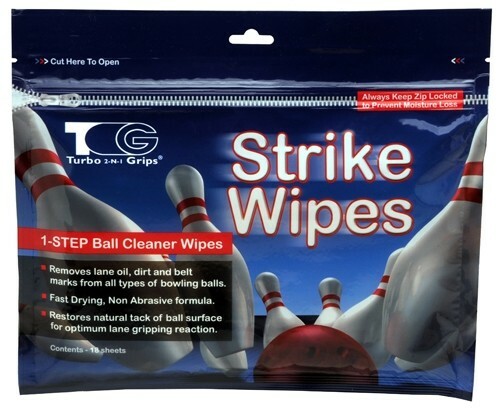 By cleaning the ball immediately after bowling, you prevent any surface grime from penetrating into cover stock. As lane oils and other dirt penetrate the cover stock material, the ball will lose significant performance quality. Keep your ball in striking condition with these convenient and disposable travel wipes. No more bottles and messy rags to tote around. Approved for PBA and USBC competition. Unlike other spray or liquid cleaners, Strike Wipes are permitted for use during competition. Keep your ball in striking condition with these convenient and disposable travel wipes. No more bottles and messy rags to tote around. Approved for PBA and USBC competition. Unlike other spray or liquid cleaners, Strike Wipes are permitted for use during competition. I use them and buy them by the box , I purchased these for my wife so she would have them whenever she needed them. what is process for cleaning ball? Hi, after you are done bowling you would use one of the wipes to wipe down the ball. Allow it to dry for a moment, and then wipe off any excess with an oil free towel (microfiber towel). Will a package of these fit in the front pocket of the radical accessory bag? Or is the package too big for that? Due to the time it takes to produce the Turbo Strike Wipes Zipper Pack ball it will ship in immediately. We cannot ship this ball outside the United States.